REDMOND, OR -- Governor Kate Brown traveled to Central Oregon, Wednesday, to draw attention to disaster preparedness. She visited the Redmond Airport to learn about its position in the state’s plan to respond to a large-scale disaster. Roberts Field is predicted to be the only working airfield large enough to handle a large jet, following a devastating earthquake. Governor Brown asked Deschutes County Emergency Manager Nathan Garibay about the lessons learned during the recent statewide Cascadia Rising Earthquake drill. He told the Governor, "I think, the lesson learned is we need more practice." She agreed, "On the ground, we need to make sure that our state employees are prepared, that our families are prepared, that they have the supplies and are ready in such an event." She toured the airport with Garibay and Redmond Mayor George Endicott, getting an update on the recent runway repaving project and a briefing on the city's plans to build a new 7,000 square-foot facility that will eventually house the new Central Oregon Interagency Dispatch (COID) center. She says the state learns from how the region responds to wildfires. "How do we make sure Oregon is prepared and ready for natural disasters? And, I think this facility is truly amazing, the level of collaboration between federal agencies, county emergency services, and state to insure that we have a key spot in Oregon to meet and greet in the event of a disaster." Officials expect to break ground on the new COID center on August 15, with completion slated for April, just in time for the 2017 fire season. Governor Brown tells KBND News, "As you know, Oregon’s wildfire season has grown longer and more severe. And, to have a facility to coordinate our attack and prevention, is really key." 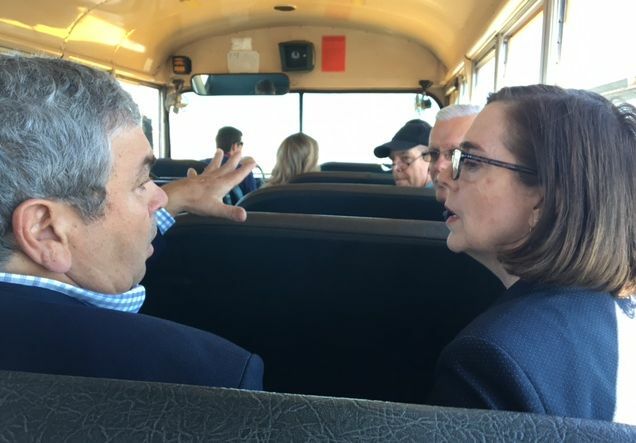 After the airport visit, Governor Brown toured the neighboring Deschutes County Fairgrounds - designated as a staging area for FEMA's response to a Cascadia quake. (Upper Left) Redmond Mayor George Endicott and Gov. Kate Brown tour the airport. 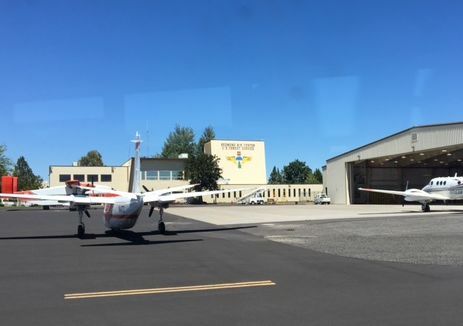 (Right) The current USFS air center, near where the new COID facility will be built.